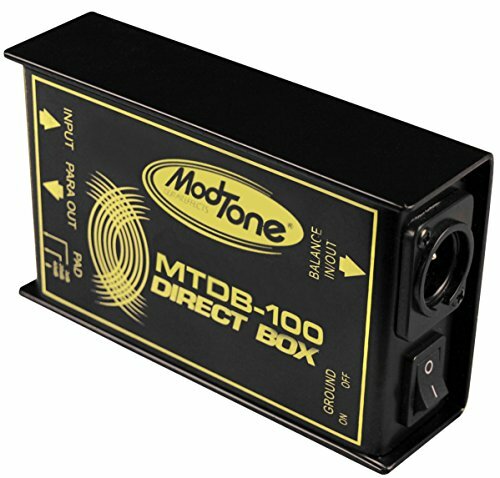 MTDB-100 direct box converts any 1/4" signal to a balanced XLR microphone output. This DI box is rugged all metal construction built to last for show after show. Features include a ground lift, to eliminate unwanted hum, a parallel output to run your instrument through an amplifier at the same time you send signal to the sound system, great for monitoring your performance, and a 3 way pad to control your signal output including 0dB - signal goes through at full volume, -20dB cuts a hot signal back to keep from overdriving a sound system, -40dB will stop many signals from passing through at all, great for open mics or any situation where instruments need to be switched out. Clean quiet and reliable, perfect for Acoustic Guitars, Keyboards and Bass Guitars (solid body or electric).